The Locrian Ensemble are firmly established as one of Britain’s most popular touring classical groups. They have a host of television and film credits to their name and recently topped the classical charts with their score for the BBC’s television drama, Wolf Hall. These charismatic entertainers perform their Christmas show in lavish period costume, and in front of an evocative candlelit setting. The show includes carols, familiar Xmas tunes and string medleys of shimmering strings and thrilling harp playing. They are joined by Jill Washington, West End star soprano of Phantom of the Opera, who will sing songs ranging from Handel’s ‘Messiah’ to ‘White Christmas, ‘The 12 Days of Christmas’ and ‘Walking in the Air’. When not performing in theatres, members of the Locrian enjoy high-profile careers working in London studios with top names in the pop world, as well as appearing on the Oscar-winning soundtracks to films such as Harry Potter, Lord of the Rings, Gladiator and The Da Vinci Code to name but a few. On television, they topped the classical music charts in 2015 with their recording of Debbie Wiseman’s score to Wolf Hall, as well as performing for Father Brown, The Coroner and Judge John Deed. Carols by Candlelight is at The Apex on Tuesday 15 December at 7.30pm. 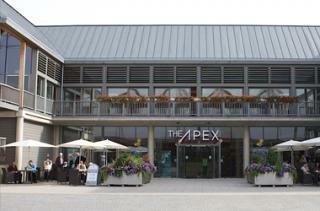 Tickets are £19, call the Box Office on 01284 758000, or visit www.theapex.co.uk for more information, or to book.